/ What Are the Rules to Using Color in Stage Lighting? If you open your eyes, and you’re like most people, you see color. I know this is simplifying it a good bit, but let’s think about just color for a minute. If you’re not colorblind, you are constantly seeing and observing color. Color is a fascinating attribute that we can use in stage lighting to help show the emotion being set forth by the presenter we are lighting. In fact, I believe that color is the very most impactful attribute of lighting that we have to work with. Let’s dive into lighting color theory – we’ll learn how we can use it, and then how to break free from the “rules”! Have you ever noticed how opposing colors selectively absorb other colors? For example, when you point a blue light at a red surface, it makes the surface look black! Why doesn’t the surface look blue? Or perhaps you’ve noticed a restaurant or trade show that lights the focal points such as tables or products in white, while most of the ambient light is colored? Colored Environmental Lighting Photo From Hasn on Flickr. When you step into the church world, you see color used in many different ways. Pretty much every church has colored walls or carpets. 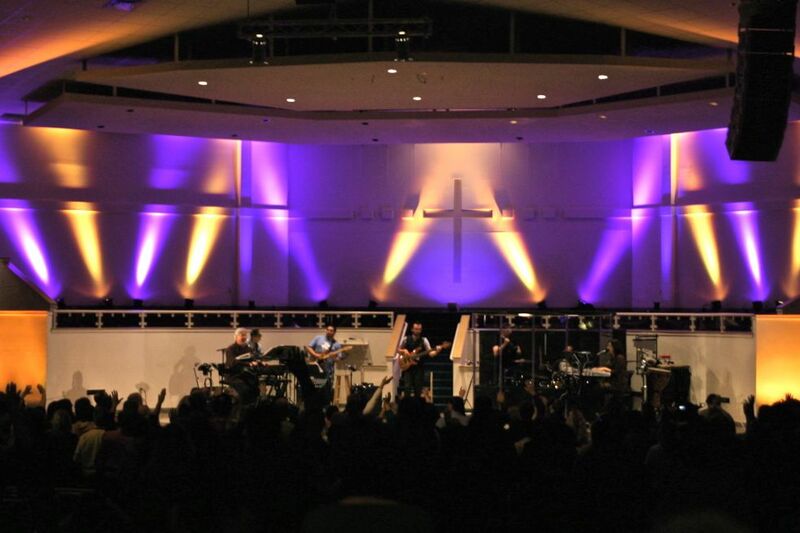 Some churches use color sparingly or not at all in their lighting scheme. Others use mostly colored light with little white light. Some transform a room with color as well as lighting the stage. If you haven’t used much color before in your lighting setup, here’s a quick guide to using color in your stage lighting. “The Rules” – Lighting Color Theory Debunked and Demystified! Stage lights have grown and evolved over the years, and today we have 3 main ways to color a light source. RGB mixing in a nutshell. Thanks to cbstottle on Flickr! The first method of coloring light is the additive theory and method which presents itself primarily in RGB LED lighting. LED’s can also include an amber and/or white LED along side of the RGB to give you some more options and flexibility. Additive colors work by fading up and down the colored LED’s or lights in order to mix the desired color. The additive color theory also works with conventional lights that are gelled, and you can mix colors when pointing 2 lights at the same object from about the same position. As a result, additive color mixing is the best way to get really deep colors, as the next method, subtractive color mixing, loses a lot of output when mixing deep colors. Thanks to John Snape for this photo! Many moving lights and conventional color mixing engines feature a white lamp which emits light through a set of 3 color wheels- Cyan, Magenta and Yellow. Using the colors in CMY mixing when subtracting from white light gets better results than using Red, Green and Blue to subtract, and allows you to mix better deep colors. The other, although dying, mode of subtractive color mixing is colored gel. The gel sits in front of a light source and filters out the color from the light, thus subtracting wavelengths of light from the source. You can match many colors with RGB and CMY sources, but the funky-ness comes when you note the efficiency of such mixing. For example, let’s mix a deep red. With RGB, you just bring up the red color, and it’s a great, bright, rich red. With CMY, you subtract Magenta and Yellow at full, and you’ll get a deep red- but by that point, it won’t be very bright because you have subtracted so much light to get there! For this reason, most CMY moving lights have a separate color wheel with colors such as red, congo blue, light pink, orange, CTO, purple, and whatever other colors that particular manufacturer decided was hard to mix on their fixture. Still, as a designer, there will still be times where you look at the deep color mixable on your CMY source, sigh, and move on to just mix a color that complements what you are doing with your RGB lights. That’s just life, sometimes! However, with the way that technology is progressing, LED’s are becoming more advanced and producing better colors than ever before, so this may not be such a problem in the future! Here, at the request of a fabulous reader, I want to present to you with how to mix certain colors in each colorspace, and what kinds of colors go together, and the moods that they best fit! Let’s dive in! The most basic lighting consoles will simply use faders to mix your colors, and if you want all of your fixtures together, you have to either build a submaster or address them all together on these basic setups. Avolites Pearl Moving Light Console. From AV Hire London on Flickr. Moving light consoles typically have a few options for choosing and mixing colors on your fixtures. The first is selecting them and mixing the colors using the encoder wheels. You may also have an option of using a color picker or HSL – Hue, Saturation and Lightness mixing. Both the color picker and HSL mixing are typically the best, and possibly the only way to mix a color when you have both RGB and CMY lights selected at the same time. For the exercise below, I want you to either use the encoder wheels or the faders on your console to manually mix the colors. Stay away from the color picker and HSL mixer for right now – they’re great tools, but can lead to disappointment when you select a color and then what you get out of your lights is not all that close to what you selected! It’s also really important to understand how to mix the colors, so that when it comes time to make a slight modification to a color, you know exactly which wheel to grab. *It’s also very important to note that, since every light fixture is different, you’ll have to custom mix each color you like for your fixtures to get an exact match. Sit down at your lighting console with just RGB lights selected. Slowly, over 10 seconds, mix each of the colors above and fade between them slowly. Now, you’ve seen 90% of all the colors that you can mix with your RGB lights. If you have an Amber or White LED, work with adding that in and see how it affects the colors you’ve mixed. At this point, your brain will probably be figuring out the other 10% of color mixes possible! Try bringing in the 3rd color slowly as you have these mixed and note the great pastels that result. Also note the colors when one color is at full, and the other is at 50% intensity. Keep playing around and you’ll learn a ton! Try the same exercise as prescribed above for the RGB colors, and also cycle through the fixed color wheel if your lights have one. If you have both RGB and CMY mixing lights in your rig, dial up the same colors on both lights, and see the difference. You’ll notice that when you really bring up intensity on the CMY wheels, your colors will get very dark and ugly compared to the RGB fixtures when you bring them up in intensity. You would think that you may be able to recreate the exact match of colors with your RGB colors and CMY colors, and sometimes you can. However, specific shades of any color can be difficult to match on the 2 different color mixing types for a number of reasons including LED color wavelength, and the “dead areas” where RGB and CMY can’t match. You can see this in action by using your consoles color picker, and poking around at colors, especially saturated ones. Some colors will not match on the lights, even if they match on the screen! This is because CMY color wheels subtract from white light, instead of adding colored light like RGB. Physics gets in the way of the ideal in these circumstances! Darn physics! However, you can keep that in mind as you program and use the strongest colors from both your CMY and RGB fixtures in your looks. Let’s switch gears now and talk about colors and color combinations that go really well together with specific moods. First things first, let’s go over colors and their emotional connections. Every color has some kind of emotion tied to it, and color is just one way that we can express mood with stage lighting. These colors generally express the emotions listed. Of course, this is a very simplified way of sharing moods with you, as there are so many millions of tints that each have their own character and moods. For example faster songs tend to go best in red, yellow, or other bright colors, and slower songs look great in blues, purples and greens. I hope that this gets you started thinking about how colors make you feel, and how you can apply that to lighting. So, without further ado, let’s jump in, talk and look at our first type of color scheme, monochromatic color schemes. Complementary colors are hues which are directly opposite of each other on the color wheel. These include red/green, blue/yellow, orange/purple and teal/amber. These colors naturally look great together, and therefore are the colors that make up most holiday colors and corporate logos. Complementary color schemes are very balanced, and don’t really trigger specific emotions like monochromatic color schemes do. It’s worth mentioning that there are a billion different ways to combine colors together- the possibilities are endless. Triadic – Triadic colors are like complementary colors, but in a triangle across the color wheel. A good example of this is red, green and blue or cyan, magenta and yellow. Analogous – Analogous color schemes feature colors that are next to each other on the color wheel. Think about green, yellow, light green, or teal, blue and violet. Warm / Cool – Warm and cool color schemes feature colors that – you guessed it – have warm or cool colors exclusively. Examples include red, orange and yellow or blue, teal and light blue. Rainbow – Multicolored madness. Some moving lights have a really fun multi-colored gobo inside of them! There Are No Hard and Fast Rules- Use Color Where You Want! The “lighting rulebook” would tell you that you need to always light people in white. Truth be told, people look good in white. And while I agree with that point for your pastor and probably your worship leader, it’s not a hard and fast rule for all of the time. The truth is, you need to light people the way that expresses the message of the church’s leadership, and sometimes, it’s okay to get a little artistic. At this point, we’ve all heard that you light fast songs with red, and slow songs with blue. But what if you light a slow song with red, or a fast song with blue? The rules also state that you can’t use green for front light, as it makes people look sick. But what if they are doing a cover of Flyleaf’s “I’m so sick”? Not such a bad idea anymore! If you are starting from the entry level of using color in your lighting, you probably shouldn’t stray much from the “rules”(see above). The rules and conventional wisdom are a great way to learn and study how lighting works in your context. However, as you become a more experienced lighting designer you will find you sometimes want to stray away from these rules, it can look great when you do. Colors are different for every song, and it’s all about the interpretation that you feel, as long as your leadership agrees with your interpretation. Let’s not start any power struggles here! Want to learn more about when to use color in your show? Read the full post here! 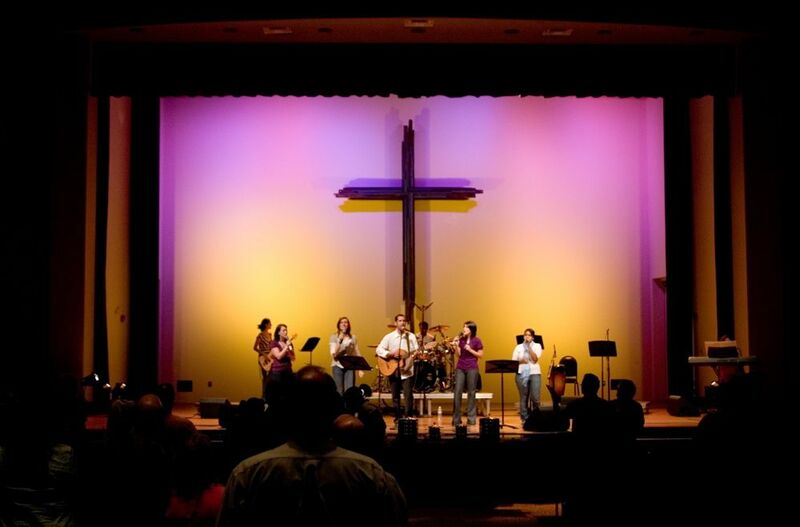 Hopefully, by reading this guide you’ve gained a few tips to add some color into the lighting scheme at your church, in your band or other show. Starting out with a splash of color on a wall or as backlight can be a great place to start to begin to learn how color works. Experiment from there, as you desire and see what works best for you. Don’t feel like you have to make everything in technicolor all at once, but it doesn’t hurt to try some new things! thanks so so, am glad that i ave good lighting gears from blizzard lighting, mostly i use tough pars, rokbox, sgm moving spots, sgm moving leds and others. thanks so much.